I’ve recently talked about my wants for the next generations of iPod Touch and Apple TV which we could see next Wednesday. The Apple TV is not necessarily a certainty for the show but it will come sometime soon. They just might focus on iPods only for the time being. I now want to go over what I hope the next generations of Nano and Shuffle will bring to the table. These aren’t products that I would typically buy these days due to the iPod Touch doing so much more, but they are fun to speculate about. Touch screen and no click wheel – The leaked shots of cases for a supposed new, smaller and square nano combined with the leak earlier this year or a 1.7 inch touch screen would indicate that Apple are going in a radically different direction with the nano this time around. Personally I find the click wheel fiddly on my old 2nd gen nano and I think it’s time they got rid of it, iconic or not. They still have the classic to fly the click wheel flag. Cut down version of iOS – because the device will be so small, they can’t use the regular iOS interface. They’ll have to cut it down further to fit on this device but it will save space and look great. Camera – I hope the camera stays part of the package although it is weird to envision one on a device so small as it could be difficult to hold. Still, I hope they do keep it and up the resolution as well as allow stills to be taken. Radio – Hopefully the radio also stays as this is a feature I personally would find very useful. 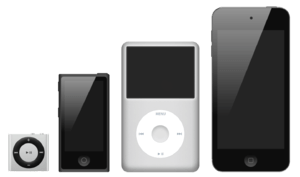 New form factor – The only way I could see the shuffle getting any smaller would be if they incorporated it into a necklace or into the headphones themselves. Personally I’d prefer to be able to use my own headphones. You could do a wearable necklace shuffle with the controls built into the the strap somehow. You could then have a cable tidy solution to stop the headphone cable hanging down and bouncing everywhere as well. However, they will probably just play it fairly safe, or just remove the product entirely and replace it with the new, smaller nano. Voice control – The nano already has voice over support. iPod Touches come with a mic in the headphone control and this feature would make sense on a device like the shuffle which obviously doesn’t have a screen and is designed to be used during exercise. The event is next Wednesday at 6.00 pm UK time. It’ll be interesting to see if any of this and all of the other rumours end up coming true. I’m excited to find out.